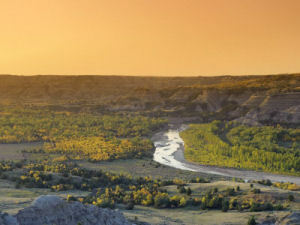 From the fertile Red River Valley of the east, abundant with oceans of wheat, to the vast plains and rolling hills, to the Missouri plateau and Badlands of the west, there is majesty in the open land of North Dakota. There is majesty in the skies of the day, and there is majesty in the stars of the night. This name commemorates the International Peace Garden on North Dakota's border with Manitoba, Canada. The International Peace Garden was dedicated on July 14, 1932. The nickname was made official by the North Dakota legislature in 1957. This nickname recognizes the Dakota tribes of North Dakota. The Dakota are also referred to as Sioux. See below. Similar to "The Land of the Dakotas," this name recognizes the Sioux or Dakota people of North Dakota. This nickname was used to promote tourism in the state in the 1960s and the 1970s. It references Theodore Roosevelt's short-live excursion into the cattle ranching business in North Dakota. On a buffalo hunting trip to the North Dakota Badlands in 1883, he was moved to purchase an interest in the Chimney Butte Ranch, also known as the Maltese Cross Ranch. After the tragic deaths of his mother and wife on the same day in 1894 and after the 1894 Republican convention in June, Roosevelt headed back to North Dakota to seek some peace and solitude. 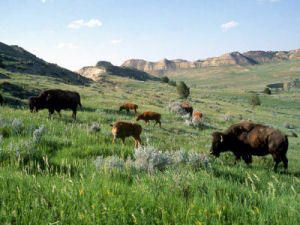 He purchased another parcel of land, located about 35 miles north of Medora, and named it the Elkhorn Ranch. Roosevelt's ranches were run by others as he spent most of his time in the east. His last visit to the Elkhorn Ranch was in 1892 and by 1898 he had sold all his holdings. This nickname references the Richardson Ground Squirrel (Spermophilus richardsonii) of North Dakota. This squirrel flicks, or jerks, its tail while running and just before entering its borrow. The Flickertail March, by James D. Ployhar is North Dakota's official state march. North Dakota is sometimes called "The Great Central State" because it of its location in the center of the great western Wheat Belt. People who live in North Dakota or who come from North Dakota are called North Dakotans. The fourth commemorative quarter-dollar coin released in 2006 honors North Dakota, and is the 39th coin in the United States Mint's 50 State Quarters® Program. 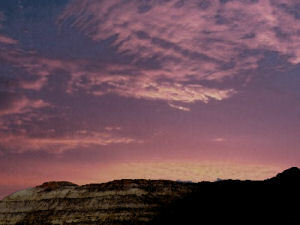 On November 2, 1889, North Dakota was admitted into the Union, becoming our Nation's 39th state. The North Dakota quarter depicts a pair of grazing American bison in the foreground with a sunset view of the rugged buttes and canyons that help define the State's Badlands region in the background. The coin's design also bears the inscriptions "North Dakota" and "1889." The North Dakota Quarter Design Selection Process was launched by Governor John Hoeven on April 14, 2004, when the State's nine-member commission was announced. Chaired by Lieutenant Governor Jack Dalrymple, the commission invited North Dakotans of all ages to submit narratives of 50 words or less. After reviewing thousands of suggestions, the commission recommended three narratives for design development: Agriculture, Landscape and Badlands. Candidate designs were developed by the sculptor-engravers of the United States Mint and artists in the United States Mint's Artistic Infusion Program and returned to North Dakota. On June 3, 2005, Governor Hoeven recommended the "Badlands with Bison" design for the North Dakota commemorative quarter-dollar. The Department of the Treasury approved the design on July 20, 2005. One of the two other design concepts considered during the final selection process was "Agriculture," the predominant industry in the State. This design included an aerial view of a modern farm with bountiful fields under an open sky. The other finalist, "Landscape," featured migrating waterfowl and the sun breaking through clouds over a vast, sweeping landscape scene. North Dakota (From Sea to Shining Sea) , by Robin L. Silverman. 80 pages. Publisher: Scholastic Library Publishing (February 2003) Reading level: Grades 3-5. Presents information about North Dakota's people, geography, history, landmarks, natural resources, government, state capitol, towns and cities, and more. North Dakota (World Almanac Library of the States) , by Justine and Ron Fontes. 48 pages. Gareth Stevens Publishing (February 2003) Reading level: Grades 4-6. Filled with the most up-to-date information, including the latest Census results. Full-color photos bring to life the story of North Dakota. In addition to an in-depth factual profile of North Dakota in the form of a state Almanac, this book offers fascinating and lively discussions of the state's history, people, geography, government, economy, culture, and lifestyles. A section on Notable People, a calendar of events, and enough primary source documents, time lines, maps, and other tools to make this unquestionably the best young adult reference material on the USA available anywhere. History of North Dakota , by Elwyn B. Robinson. 610 pages. Publisher: North Dakota State University: Institute for Regional Studies (October 1995) Elwyn Robinson's sweeping History of North Dakota has become a classic in American state histories. One of the state's great professors and historians takes into account not only politics, but sociology, economics, ethnology, theology, nature studies and geography to describe North Dakota to the world and to itself. Geography, in particular, formed the basis of Professor Robinson's historical interpretation. His "too-much mistake," the belief that North Dakota built too much, too fast, in an isolated area buffed by a difficult climate, has become the guiding principle for a quarter century of historical debate on Dakota plains history. Long out of print, Professor Robinson's 1966 work was reissued, in 1995, by the Institute for Regional Studies at North Dakota State University, Fargo.